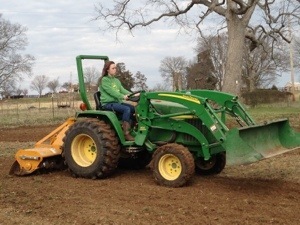 With spring just a few weeks away, we were anxious to get the garden tilled and ready for this year’s seeds. If tractors could talk, I know ours would tell you how good it felt to get out of the barn and do some work. It was also a chance for Faith to learn about PTOs, clutches, and tillers. She was a natural.